Fender CD-60S Guitar Review 2019 – is the Fender CD-60S acoustic guitar worth the money? Review of features, pricing, design, sound and more. Fender, a guitar manufacturer, has upgraded its original classic CD-60S guitar. The new model, Fender CD-60S Guitar, comes with amazing features such as a fine spruce top, a smooth and stylish rosewood fretboard, a mahogany back, neck and sides, and an easy-to-use profile. Basically, the acoustic guitar is built for the modern guitarist. It combines quality, style, playability, and value. Actually, very few guitars on the market can match the specifications of the Fender CD-60S. The size is small but this should not confuse you to believe that its sound is average. The tone it produces is amazing. To help you understand the guitar better, here is a comprehensive Fender CD-60S Guitar review. • Body: The body shape of the guitar is dreadnought and it features classic tonewoods. The body is generally designed to contribute towards rich sound production. The back, as well as the sides, are made of laminated mahogany. In total, the body measures 25 inches. • Neck: The neck is primarily mahogany. It features an easy-to-play profile. The design of the neck makes the guitar to feel just good when held. The neck is joined at the 14th fret. • Hardware: The hardware is void of electronics, thus easy to used. It features die-cast tuners, plastic nut, and a rosewood bridge. • Strings: The guitar features a total of 6 strings and they are all steel. • Fretboard: The material of the fretboard is rosewood. • Accessories: The guitar is accompanied by a hard-shell case, plectrums, picks, digital tuners, strap, and an instructional DVD. 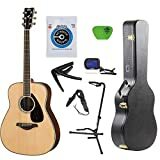 This guitar is a product of Fender and comes with a model number 961539206 on Amazon. Its size is CD-60S. • Attractive design: This guitar has an elegant laminated top that is complemented by beautiful mahogany sides and back. • Versatility: The guitar can be played in any style that you like. • Durability: It comes with a protective hard shell that guarantees longevity. • Solid-top volume: The guitar is rich in tone and it sounds as good as it looks. • Bargain price: The price quoted ($239) is a bargain if you consider how great the guitar sounds and its durable and attractive design. • Comfortability: The guitar structure plus the strings feel good when held. • The sound quality is not great, especially for advanced guitarists. It only works well with beginners and intermediate guitarists. • May need frequent retuning if you want to maintain quality sound. • Fender CD-60S Guitar Vs Fender FA-100: The two guitars have some resemblance. For example, they are both right-handed and feature rosewood fretboards. The top material in both cases is spruce and they use 6 steel strings. The difference is in their sizes and sound production. The Fender CD-60S guitar is slightly bigger in size and richer in sound. Thus, it’s a better choice over its counterpart if you are looking for quality. Nonetheless, you’ll have to pay more ($239) as opposed to $169, in the case of the Fender FA-100. • Fender CD-60S Guitar Vs Fender T-Bucket 300CE: The two guitars also have similar designs and are almost similar in playability. At times, it’s difficult to distinguish them. However, the Fender CD-60S Guitar is slightly bigger (45-inch-long) and heavier (19 pounds) than the 300CE, which is 44-inch-long and 10.3 pounds heavy. The sound quality of the 300CE is slightly superior and that’s why the guitar is costlier ($329.99). • Fender CD-60S Guitar Vs Fender CD-1405CE: These two guitars are right-handed, mahogany built, and use 6 strings. They also have similar finishes. The difference is in the sound where the CD-60 enjoys more quality than the CD-1405CE. Thus, it (CD-140CE) is great even for experienced guitarists. 1. Is the guitar acoustic-electric? No. It’s just an acoustic type. The idea of calling it acoustic-electric is because it can be plugged into a power source in case you want to amplify the sound. 2. Does the guitar come ready strung? What is the type? Yes, it does. All the 6 strings are properly fitted and ready to be played upon purchase. The strings are fender type, made in the US. 3. What is the actual length of the guitar? It measures 45 inches in length. 4. What is packed with the guitar when it’s shipped? The guitar comes with a hard case, picks, tuner, instructional DVD, strap, and soft polishing cloth. 5. How is the guitar shipped? Does it come as one unit in a single pack or the parts are put in separate boxes? The guitar comes in a specific case as a single unit accompanied by the accessories. The Fender CD-60S guitar is a great option for passionate guitarists. It’s easy to play and comes with exceptional features. The price is also a bargain considering that the instrument delivers on its promises. We recommend it to beginners as well as intermediate guitarists who are looking for quality, style, and versatility in a guitar. Based upon feedback submitted by over 100 customers the Fender CD-60S Guitar has received an average 4.6 out of 5 star rating. We discuss why in this review article.